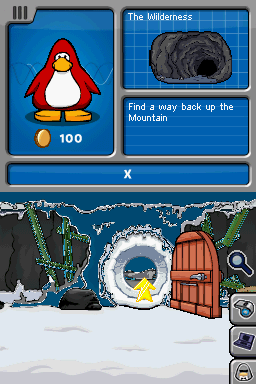 This page will include tricks and glitches for both Club Penguin DS games - Elite Penguin Force and Elite Penguin Force: Herbert's Revenge. NOTE: List not final, research not complete. When the HUD menus open, you can click the NPCs with the cursor juuust when the HUD menu is starting to open (Frame specific), not when its fully open or when its not opening at all. After you talk to them, the Gadget or Item menu will get stuck. The Gadget menu will not work properly, but the Item menu will do. This does save time both in real time and in TAS time. NOTE: This glitch doesn't work with the Puffle selection menu due to a different structure in gameplay and loading bytes in their address code. Every textbox has a specific set of frames when you can skip a dialogue box. In Herbert's Revenge, its always a 10 frame window in order to skip a dialogue box (unless the room you're in is lagging when you're skipping text), and there are very rare instances where you can skip them earlier, if the textbox has a [...] on the lower right corner of the box. Skipping text in the Original EPF however, is quite a bit different. It's 3x times slower than Herbert's Revenge for some strange reason, being 30 frames instead of 10, and there's no known way to speed up the process of skipping text in that game so far. You can click on NPCs and everything else before the fade-in transitions in game. Those screens are very specific and cannot be performed every single time. You can only perform them when starting a mission or quitting a minigame or even quitting your clothing and objectives screens. Like the above trick, you can do this on very specific transitions too. Only this time you have limited time to do something. TODO: Add gif to this thing. Theres a frame perfect trick that saves time during a dialog. When hitting the first or second decision in a decision box selection on a specific timing, you'll save frames depending on the 1st or 2nd choice box. (You can't do this on the 3rd choice box). Movement in-screen is also helpful, clicking the cursor in a different location is faster than moving it to that location. Also this involves clicking on NPCs and locations too, with a correct frame rule. This also involves the Map, by clicking on a Map location multiple times than just clicking it once. NOTE: Dragging items is faster on the Item Menu, double click is faster on the Gadget Menu. TODO: Add gif image of the glitch in action. Using an Elite Puffle, you can hit blocked objects by passing through a specific sprite layer between the blocked object and the HUD. The game was not fully programmed to detect this bug that saves time depending on the situation. This glitch involves a HUD menu, and pressing the D-pad to move the cursor. When moving the cursor enough with the D-pad with a HUD menu open, the cursor will move outside from the camera and the game will not follow it. When the HUD menu closes and you stop moving the cursor, the camera will freeze and it will not move at all, unless you use the touch screen to move the cursor and every thing will get back to normal. But if you close the HUD menu while moving the D-pad to the left or right, the camera will get launched and it will scroll the screen really fast, faster than any normal way. The glitch will get cancel when the cursor is on screen again, so be careful with that. This saves time mostly on not rotational rooms in the game (Rarely on rotational ones). TODO: Add a bunch o' details n' stuff. A way to do memory corruption. An Elite Puffle can drastically change an event, thus they're able to overwrite certain address set in an event script and so, despawning NPCs and change how set event works completely, until you restart the mission or said event ends with a new one. It's still unknown the uses it can have, but it's confirmed that it indeed corrupts memory in the games. Pausing the game and clicking an intended target with an Elite Puffle on the same exact frame, the puffle will hit the target while the game is paused, and some strange side effects might happen. You can move the map with the D-pad. Unlike ingame, moving the map with the D-pad is as fast as using the stylus, so it could potentially save few frames. TODO: Make a video of this. There's a mayor bug in the original game that saves time, and that's pausing the game... Only that. When the game wants you to talk to someone, call a puffle or even on a in-game cutscene (not fade-in cutscenes), you can pause and unpause the game and the cursor will be reactivated, being able to do things you won't normally do, like moving around the map. The biggest use for this, is to move the cursor out of the screen, and scroll really fast like the Puffle Scrolling Glitch. It also helps to Puffle Scroll and HUD Off with all of the 3 menus, which can save time depending on the room and situation. It can also be used to select things earlier. Works in v1.0 and every other version of the game so far. Same as Herbert's Revenge, but with different execution and different effects. In this game whatever cursor you have, you can go to different areas and keep the cursor state you're in. Potentially saves time. TODO: Explain it's causes and effects later as well. Theres 1 frame on the blue screens where you can do a touch screen input. With it you're able to do a small camera boost though is not as big as regular BSS in the sequel. When loading a puffle with the whistle and you currently have one already active, you can still make the puffle do the action while the other puffle is spawning. This involves the Puffle selection menu and one of the other 2 menus. Get the Puffle menu open, then close it and in perfect timing, click on other menu (gadget one recommended) and the puffle menu again when its not fully closed, and you got 2 fully functional menus open! You can perform the HUD Off glitch on the Items menu to get the 3 menus open and functional at the same time! During a fade in transition when you get a call, you can click on the use phone button to skip the phone call and the objective/event will be triggered instantly. This only happens on fade in transitions, not anywhere else. You can only skip minigames in the sequel, not big math, just press the skip button on the screen as fast as possible and you'll skip it. After a cutscene, a minigame skip of any other specific fade to black, while clicking on an exit, the switching from room to room will glitch and it will load the next area much faster than usual. TODO: Research further this and explain later. On the first frame when you can move the cursor on a blue screen transition, touch on the farthest pixel left/right and then move the cursor with the D-pad. If done correctly, you'll boost the camera like the Puffle Scrolling Glitch. The earliest known glitch found back in 2010. After beating a minigame with a set amount of coins, you can choose a level/minigame, then Start+Quit the level, you'll get the coins you got in the previous level you've done. Extremely useful in 100% runs to skip long levels and get gold medals much earlier. TODO: Add Jackhammer Skip, Heads-Up 3000 Skip, the In-game cutscene oddities and the River Overlapping Crash. Research more addresses and tricks!!! Maybe a game end glitch or something. Also sub-pixel variables for the cursor, NPCs, objects and exits. Also figure out the RNG.